Your 4th bag of Purina Strategy Horse Feed is FREE at participating Farmers Coop locations! 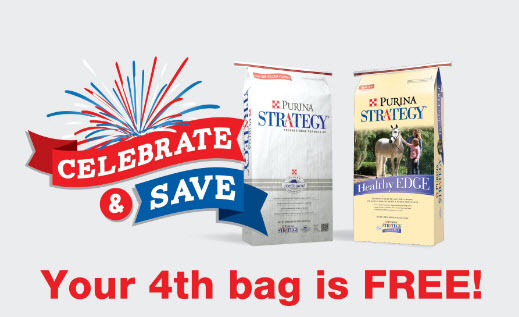 Celebrate the 4th of July with big savings on Purina Strategy Horse Feed. Buy any 3 bags of Purina Strategy Professional Formula GX or Purina Strategy Healthy Edge horse feed and we’ll give you the 4th bag FREE! All three bags must be purchased in the same transaction. Not valid on previous purchases. Offer valid July 1 through July 31, 2016, while supplies last at participating Farmers Coop locations! This entry was posted on Thursday, June 30th, 2016 at 7:48 pm	and is filed under Events, News & Updates. You can follow any responses to this entry through the RSS 2.0 feed. Both comments and pings are currently closed.